Cherrak Y., Rapisarda C., Pellarin R., Bouvier G., Bardiaux B., Allain F. Malosse C., Rey M., Chamot-Rooke J., Cascales E., Fronzes R., Durand E. 2018. 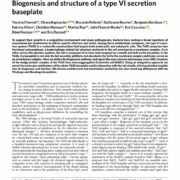 Biogenesis and structure of a Type VI secretion baseplate. Nat. Microbiol. 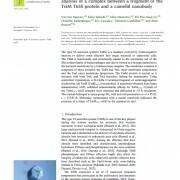 3, 1404-1416 .
see the Behind the paper “Building the blocks of a bacterial weapon” by Chiara. Santin Y.G., Doan T., Lebrun R., Espinosa L., Journet L., Cascales E. 2018. 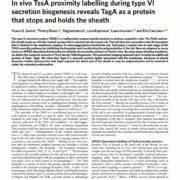 In vivo proximity labelling during Type VI secretion biogenesis reveals TagA as a protein that stops and holds the sheath. Nat. Microbiol. 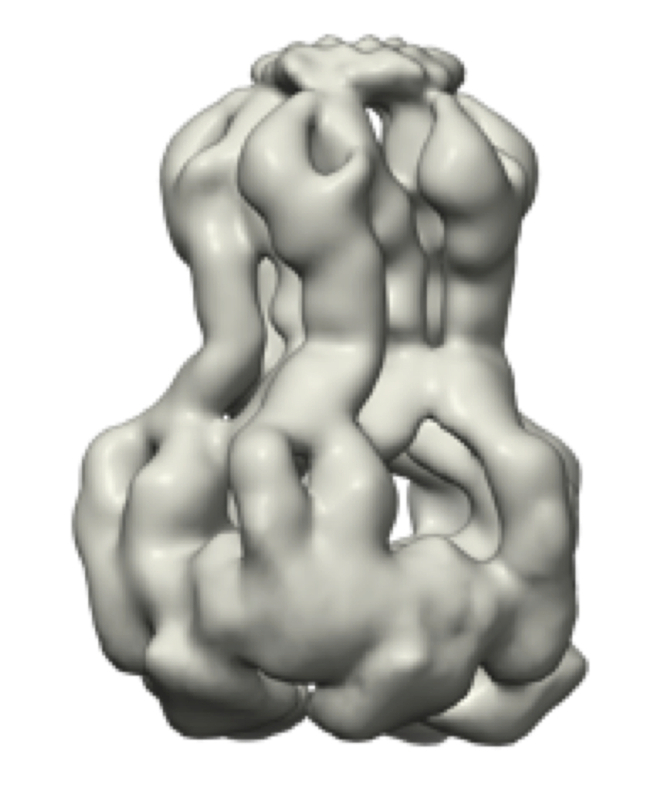 3, 1304-1313 .
see the Behind the paper “The Type VI secretion system under tension” by Yoann. 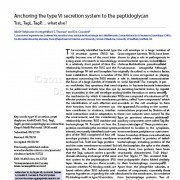 see the News and Views “Tagging the Type VI secretion system” by Olivera Francetic. Renault M.G., Zamarreno Beas J., Douzi B., Chabalier M. Zoued A., Brunet Y.R., Cambillau C., Journet L., Cascales E. 2018. 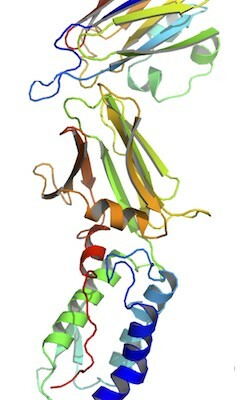 The gp27-like hub of VgrG serves as adaptor to promote Hcp tube assembly. J. Mol. Biol. 430, 3143-3156. Zoued A., Duneau J.P., Durand E., Espana A.P., Journet L., Guerlesquin F., Cascales E. 2018. Tryptophan-mediated dimerization of the TssL transmembrane anchor is required for Type VI secretion system activity. J. Mol. Biol. 430, 987-1003. Chassaing B., Cascales E. 2018. 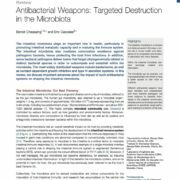 Antibacterial weapons: targeted destruction in the microbiota. Trends Microbiol. 26, 329-338. Nguyen V.S., Douzi B., Durand E., Roussel A., Cascales E., Cambillau C. 2018. 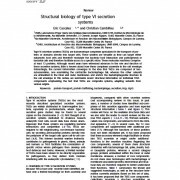 Towards a complete structural deciphering of Type VI secretion system. Curr. Opin. Struct. Biol. 49, 77-84. 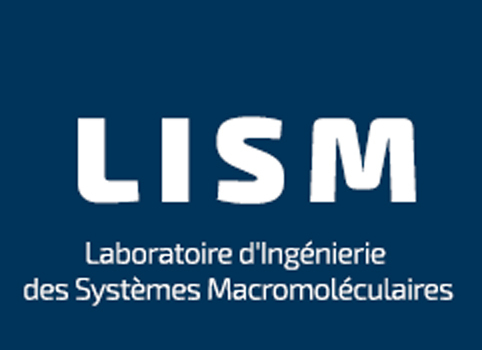 Leone P., Roche J., Vincent M.S., Tran Q.H., Desmyter A., Cascales E., Kellenberger C., Cambillau C., Roussel A. 2018. Type IX secretion system PorM and gliding machinery GldM form arches spanning the periplasm space. Nat. Commun. 9, 429. Douzi B., Logger L., Spinelli S., Blangy S., Cambillau C., Cascales E. 2018. 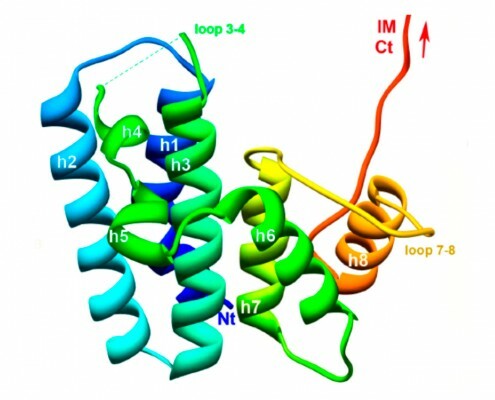 Structure-function analysis of the C-terminal domain of the Type VI secretion TssB tail sheath subunit. J. Mol. Biol. 430, 297-309. Cascales E. 2017. 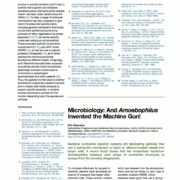 Microbiology: and Amoebophilus invented the machine gun ! Curr Biol. 27, 1170-1173. Flaugnatti N., Journet L. 2017. 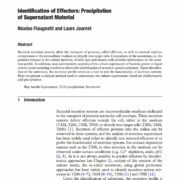 Identification of effectors: precipitation of supernatant material. Methods Mol Biol. 1615, 459-464. Durand E., Lloubès R. 2017. 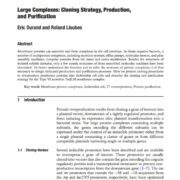 Large Complexes: Cloning Strategy, Production, and Purification. Methods Mol Biol. 1615, 299-309. Logger L., Zoued A., Cascales E. 2017. 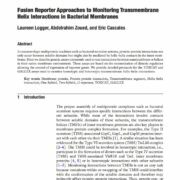 Fusion Reporter Approaches to Monitoring Transmembrane Helix Interactions in Bacterial Membranes. Methods Mol Biol. 1615, 199-210. Santin Y.G., Cascales E. 2017. 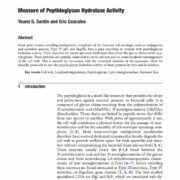 Measure of Peptidoglycan Hydrolase Activity. Methods Mol Biol. 1615, 151-158. Vincent M.S., Cascales E. 2017. 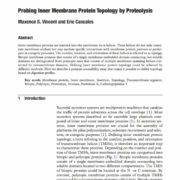 Probing Inner Membrane Protein Topology by Proteolysis. Methods Mol Biol. 1615, 97-103. Nguyen V.S., Logger L., Spinelli S., Legrand P., Huyen Pham T.T., Nhung Trinh T.T., Cherrak Y., Zoued A., Desmyter A., Durand E., Roussel A., Kellenberger C., Cascales E., Cambillau C. 2017. 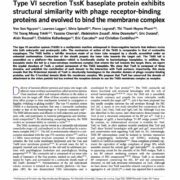 Type VI secretion TssK baseplate protein exhibits structural similarity with phage receptor-binding proteins and evolved to bind the membrane complex. Nat Microbiol. 2, 17103. Cascales E. 2017. 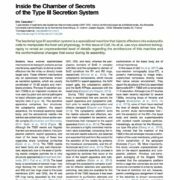 Inside the chamber of secrets of the Type III secretion system. Cell. 168, 949-951. Vincent M.S., Canestrari M.J., Leone P., Stathopulos J., Ize B., Zoued A., Cambillau C., Kellenberger C., Roussel A. & Cascales E. 2017. 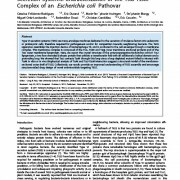 Characterization of the Porphyromonas gingivalis Type IX secretion trans-envelope PorKLMNP core complex. J Biol Chem. 292, 3252-3261. Santin Y.G. & Cascales E. 2017. 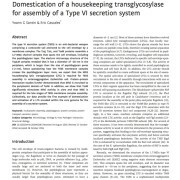 Domestication of a housekeeping transglycosylase for assembly of a Type VI secretion system. EMBO Rep. 18, 138-149. Douzi B., Brunet Y.R., Spinelli S., Lensi V., Legrand P., Blangy S., Kumar A., Journet L., Cascales E. & Cambillau C. 2016. 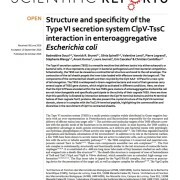 Structure and specificity of the Type VI secretion system ClpV-TssC interaction in enteroaggregative Escherichia coli. Sci Rep. 6, 34405. 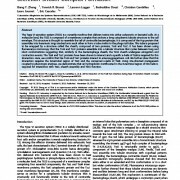 Zoued A., Cassaro C.J., Durand E., Douzi B., Espana A.P., Cambillau C., Journet L. & Cascales E. 2016. 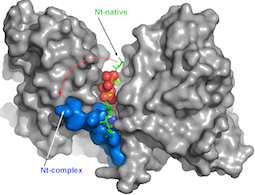 Structure-function analysis of the TssL cytoplasmic domain reveals a new interaction beween the Type VI secretion baseplate and membrane complexes. J Mol Biol. 428, 4413-4423. Logger L., Aschtgen M.S., Guérin M., Cascales E. & Durand E. 2016. 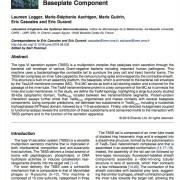 Molecular dissection of the interface between the Type VI secretion TssM cytoplasmic domain and the TssG baseplate component. J Mol Biol. 428, 4424-4437. Vincent M.S., Durand E. & Cascales E. 2016. 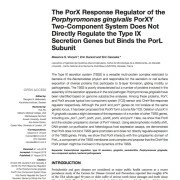 The PorX response regulator of the Porphyromonas gingivalis PorXY two-component system does not directly regulate the Type IX secretion genes but binds the PorL subunit. 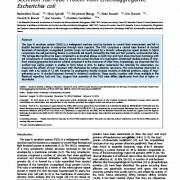 Front Cell Infect Microbiol. 6, 96. Sana T., Flaugnatti N., Lugo K.A., Lam L.L., Jacobson A., Baylot V., Durand E., Journet L., Cascales E. & Monack D.M. 2016. 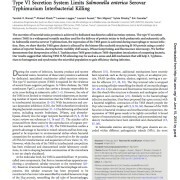 S. Typhimurium utilizes a T6SS-mediated antibacterial weapon to establish in the host gut. Proc Natl Acad Sc. USA. 113, 5044-5051. Zoued A., Durand E., Brunet Y.R., Spinelli S., Douzi B., Guzzo M., Flaugnatti N., Legrand P., Journet L., Fronzes R., Mignot T., Cambillau C. & Cascales E. 2016. 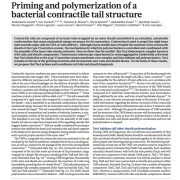 Priming and polymerization of a bacterial contractile tail. Nature. 531, 59-63. 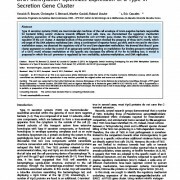 Aussel L., Beuzón C.R., & Cascales E. 2016. 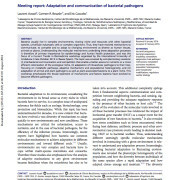 Meeting report: adaptation and communication of bacterial pathogens. Virulence. 7, 481-490. Flaugnatti N., Le TT., Canaan S., Aschtgen MS., Nguyen VS., Blangy S., Kellenberger C., Roussel A., Cambillau C., Cascales E. & Journet L. 2016. 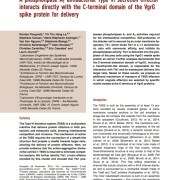 A phospholipase A1 antibacterial type VI secretion effector interacts directly with the C-terminal domain of the VgrG spike protein for delivery. Mol Microbiol. 99, 1099-1118. Journet L., & Cascales E. 2016. 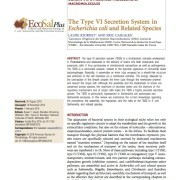 The Type VI secretion system in Escherichia coli and related species. EcoSalPlus. 7, 1-20. Brunet Y.R., Zoued A., Boyer F., Douzi B. & Cascales E. 2015. 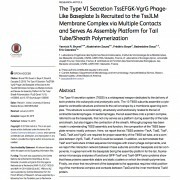 The Type VI secretion TssEFGK-VgrG phage-like baseplate is recruited to the TssJLM membrane complex via multiple contacts and serves as assembly platform for tail tube/sheath polymerization. PLOS Genetics. 11, e1005545. Durand E., Nguyen V.S., Zoued A., Logger L., Pehau-Arnaudet G., Aschtgen M.S., Spinelli S., Desmyter A. Bardiaux B., Roussel A., Cambillau C., Cascales E. & Fronzes R. 2015. Biogenesis and structure of a Type VI secretion core membrane complex. Nature. 523, 555-560. Nguyen VS, Logger L., Spinelli S., Desmyter A., Han Lè TT, Kellenberger C., Douzi B., Durand E., Roussel A., Cascales E., and Cambillau C. 2015. 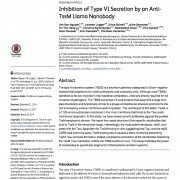 Inhibition of Type VI secretion by an anti-TssM llama nanobody. PLOS ONE. 10, e0122187. 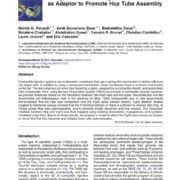 Stathopulos J., Cambillau C., Cascales E., Roussel A. and Leone P. 2015. Crystallization and preliminary X-ray analysis of the C-terminal fragment of PorM, a subunit of the Porphyromonas gingivalis Type IX secretion system. 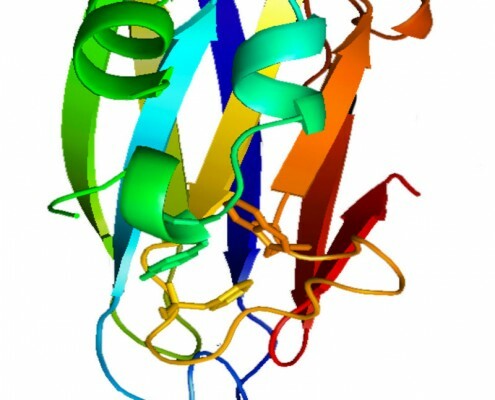 Acta Crystallogr F Struct Biol Commun. 71, 71-74. Nguyen VS, Spinelli S., Desmyter A., Han Lè T.T., Kellenberger C., Cascales E., Cambillau C. and Roussel A. 2015. Production, crystallization and X-ray diffraction analysis of a complex between a fragment of the TssM T6SS protein and a camelid antibody. Acta Crystallogr F Struct Biol Commun. 71, 266-271. Gueguen E., Wills N.M., Atkins J.A., and Cascales E. 2014. Transcriptional frameshiting rescues Citrobacter rodentium Type VI secretion by the production of two length variants from the prematurely interrupted tssM gene. PLoS Genetics. 10, e1004869. Douzi B., Spinelli, S., Blangy S., Roussel A., Durand E., Brunet Y.R., Cascales E., and Cambillau C. 2014. 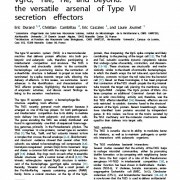 Crystal structure and self-interaction of the Type VI secretion tail-tube protein from enteroaggregative Escherichia coli. PLOS ONE. 9, e86918. Brunet Y.R., Hénin J., Célia H., and Cascales E. 2014. 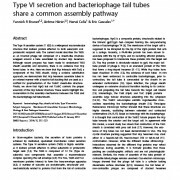 Type VI secretion and bacteriophage tail tubes share a common assembly pathway. EMBO Rep. 15, 315-321. Zhang X.Y., Brunet Y.R., Logger L., Douzi B., Cambillau C., Journet L. and Cascales E. 2013. 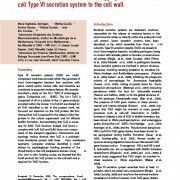 Dissection of the TssB-TssC interface during Type VI secretion sheath complex formation. PLOS ONE. 8, e81074. Zoued A., Durand E., Bebeacua C., Brunet Y.R., Douzi B., Cambillau C., Cascales E. and Journet L. 2013. 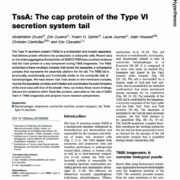 TssK is a trimeric cytoplasmic protein interacting with components of both phage-like and membrane-anchoring complexes of the Type VI secretion system. J. Biol. Chem. 288, 27031-27041. Gueguen E., Durand E., Zhang X.Y., d’Amalric Q., Journet L. and Cascales E. 2013. Expression of a Yersinia pseudotuberculosis Type VI secretion system is responsive to envelope stresses through the OmpR transcriptional activator. PLOS ONE. 8, e66615. 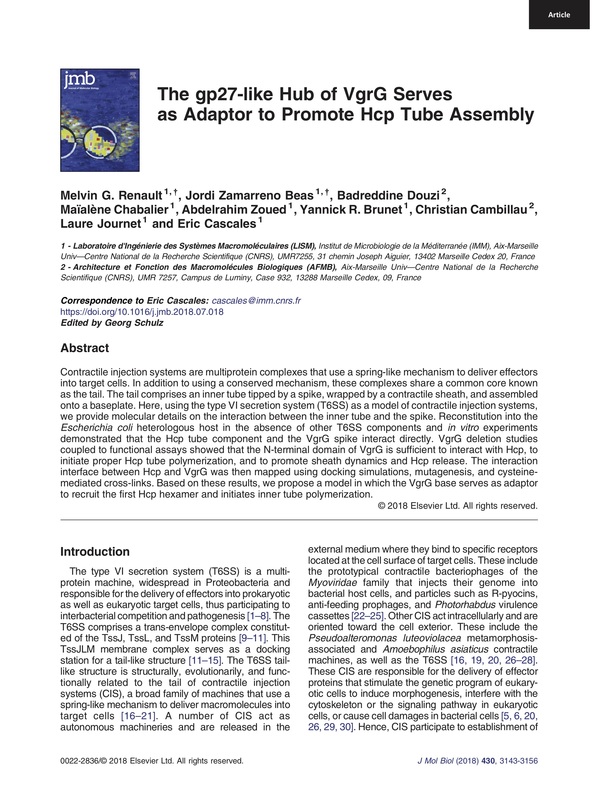 Brunet Y.R., Espinosa L., Harchouni S., Mignot T. and Cascales E. 2013. 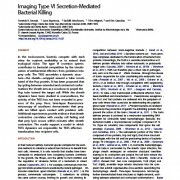 Imaging bacterial Type VI secretion-dependent killing. Cell Rep. 3, 36-41. Gueguen E. and Cascales E. 2013. Promoter swapping unveils the role of the Citrobacter rodentium CTS1 Type VI secretion system for inter-bacterial competition. Appl. Environ. Microbiol. 79, 32-38. Durand E., Derrez E., Audoly G., Spinelli S., Ortiz-Lombardia M., Raoult D., Cascales E., and Cambillau C. 2012. 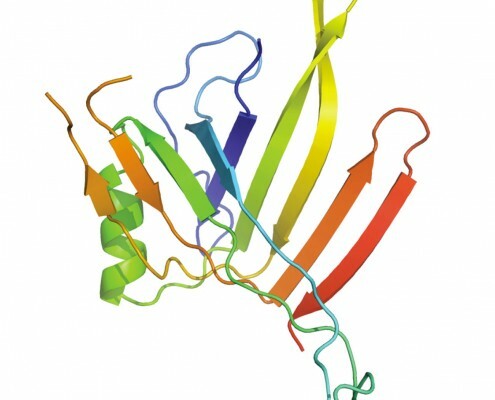 Crystal structure of the VgrG1 actin cross-linking domain of the Vibrio cholerae Type VI secretion system. J Biol Chem. 287, 38190-38199. 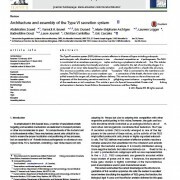 Durand E., Zoued A., Spinelli S., Watson P.J., Aschtgen M.-S., Journet L., Cambillau C. and Cascales E. 2012. 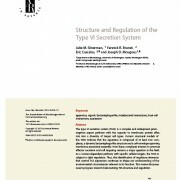 Structural characterization and oligomerization of the TssL protein, a component shared by the bacterial Type VI and Type IVb secretion systems. J. Biol. Chem. 287, 14157-14168. 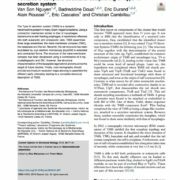 Aschtgen M.-S., Zoued A., Lloubès R., Journet L., and Cascales E. 2012. 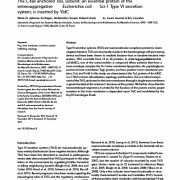 The C-tail anchored TssL subunit, an essential protein of the enteroaggregative Escherichia coli Sci-1 Type VI secretion system, is inserted by YidC. 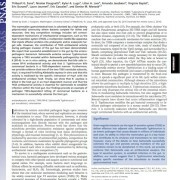 MicrobiologyOpen. 1, 71-82. 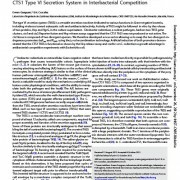 Felisberto-Rodrigues C., Durand E., Aschtgen M.S., Blangy S., Ortiz-Lombardia M., Douzi B., Cambillau C. and Cascales E. 2011. 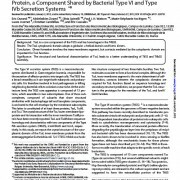 Towards a structural comprehension of bacterial Type VI secretion systems: characterization of the TssJ-TssM complex of an Escherichia coli pathovar. 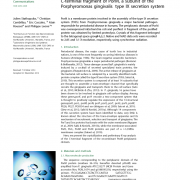 PLoS Pathogens. 7, e1002386. 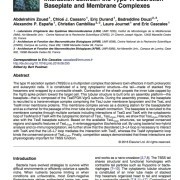 Brunet Y.R., Bernard C.S., Gavioli M., Lloubès R., and Cascales E. 2011. 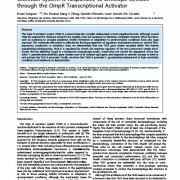 An epigenetic switch involving overlapping Fur and DNA methylation optimizes expression a Type VI secretion gene cluster. 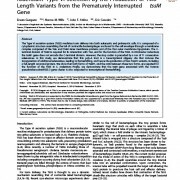 PLoS Genetics. 7, e1002205. 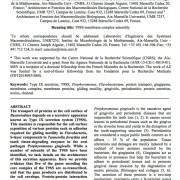 Bernard C.S., Brunet Y.R., Gavioli M., Lloubès R., and Cascales E. 2011. 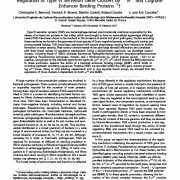 Regulation of Type VI secretion gene clusters by 54 and cognate enhancer binding proteins. J Bacteriol. 193, 2158-2167. Aschtgen M.S., Thomas M.S., and Cascales E. 2010. 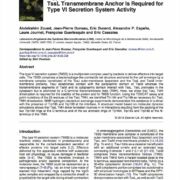 Anchoring the Type VI secretion system to the cell wall: TssL, TagL, TagP, TagN,… What else? Virulence 1, 535-540. Aschtgen M.-S., Gavioli M., Dessen A., Lloubès R., and Cascales E. 2010. 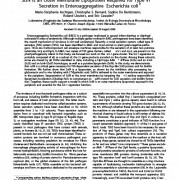 The SciZ protein anchors the enteroaggregative Escherichia coli Type VI secretion system to the cell wall. Mol Microbiol. 75, 886-899. 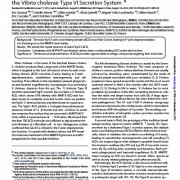 This article has been highlighted in Faculty of 1000 and has been the object of an Addendum in Virulence (Aschtgen et al. Virulence 1, 535-540). Bernard C.S., Brunet Y.R., Gueguen E., and Cascales E. 2010. 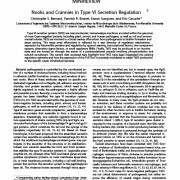 Nooks and crannies in Type VI secretion regulation. J Bacteriol. 192, 3850-3860. (Review). Aschtgen M.-S., Bernard C.S., de Bentzmann S., Lloubès R., and Cascales E. 2008. SciN is an outer membrane lipoprotein required for Type VI secretion in enteroaggregative Escherichia coli. J Bacteriol. 190, 7523-7531. Cascales E. 2008. 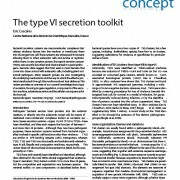 The Type VI secretion tool kit. EMBO Rep. 9, 735-741.